When the weather warms up, there’s nothing like a good pair of sandals. Too few sandals are made with actual American quality and comfort in mind though. That’s why we set out to find which companies are making the best sandals in the USA. Below are our findings along with tons of details about each of our recommendations and the factors that went into our research process. Through hours of research we ruled out dozens of unfit pairs of sandals to narrow our selection down to 7 different options that are all great in their own way. Companies like Island Slipper, Gurkee’s, Piper Sandals, Sbicca Footwear, and several others are making awesome American made footwear. We broke down our top picks into several categories, so take a look at all the different style options below and our analysis on each recommendation. If you want to explore more footwear options, check out our shoes made in the USA directory. Below are in-depth overviews of our top picks and what made each one stand out to us. Check out what we liked, didn’t like, and where to get them. If you’re serious about finding good sandals that will hold up and keep your feet comfortable on warm days, you’ll love the Island Slipper sandals. 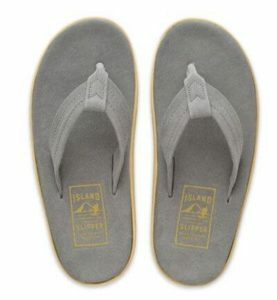 They’re hand-crafted in Hawaii, where sandals are just called slippers (we did a review on those too). They’re all formed from rugged materials like ripstop fabric, suede, and leather to hold up well over time. They also feature a tough rubber outsole that offers good solid grip and protection. We love the built-in arch support and heel cup design of most of the sandals sold by Island Slipper. These sandals are perfect for the beach because they’re smooth and easy to clean, and they’re built to last. 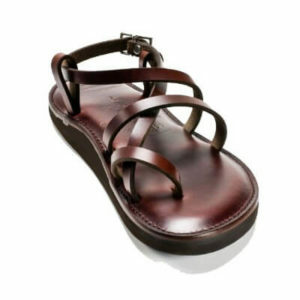 Oka-B is the ideal online store to shop for quality women’s sandals. Not only is the footwear affordable and stylish, but it’s built to last as well. There are sandals in many different shapes and styles, making it easy to find something that appeals to you. Each of the sandals features built-in arch support, a heel cup and a padded design for comfort. Many also use added metallic or stone accents for a touch of flair. We love how thick and tough these sandals feel in your hand, despite looking thin and delicate. They solve for fashion and function! Gurkee’s sandals are an impressive blend of style and function that will help you stand out everywhere that you wear your sandals. We love the laid-back style of these sandals and they’re impressive durability. 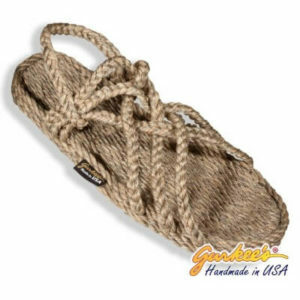 Each sandal is made from Gurkee’s trademarked Comfort Twist rope, which is just woven polypropylene carpet yarn. They’re very durable, soft to the touch, and fit really well. These sandals are simple to maintain and can be tossed in the washer and dryer to clean up. They can withstand chlorine and salt water well and the sandals are sold in many different styles and colors to suit your tastes. They are handmade right in West Virginia, and many are adjustable for a perfect fit for every foot size. These sandals are impressive, especially for their price. Most of us have purchased low-cost sandals before for them to fall apart or to be incredibly uncomfortable. That’s not an experience that most would want to repeat again, which is why many people spend more than they have to on the next pair that they purchase. This isn’t necessary with Okabashi products. These men’s and women’s sandals are durable and comfortable while remaining surprisingly affordable. We love that Okabashi footwear is composed of recycled materials sourced from the U.S. These are some of the best sandals made in the USA because they’re thick, tough and comfortable. Most users report them lasting for many years, and we expect you’ll have a similar experience. Not only do they have a charming old-school look to them, but the Original sandals by the Piper Sandal Company are comfortable, tough leather sandals that will last you many years. They’re one of the most comfortable leather sandals that we’ve tested in a long time, and that’s thanks to a few different factors. We love the smooth footpad and the moldable enough foam inner sole that creates a delightful custom fit that you’ll enjoy more with time (leather products typically take some time to break in). These sandals are made from rugged leather and feature a tough 3/8” leather strap that’s built to hold. They also come with a grippy ½” Vibram sole that will help you feel surefooted no matter what you’re walking over. These leather strap sandals are an impressive bit of engineering, they’re American made and they’re sure to get you some attention wherever you go. They’re a serious investment though, so prepare to pay for their excellent quality. Traditional Huarache sandals are famed for their comfort and longevity, and the Jared Style sandal from Sbicca Footwear is an excellent modern example of that footwear. We fell in love with this specific sandal the first time we tested it out. 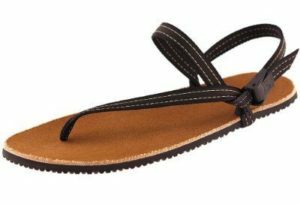 It’s made nearly entirely from a woven leather material that create a soft and smooth sandal that’s also delightfully breathable. These sandals feature a padded footpad for comfort on harder walking surfaces. They also come with a peep toe end to help bring more air to your feet while walking. The only downside to purchasing these tough sandals is that they are sold in a limited number of sizes, so make sure you can get a pair that’s going to fit you properly. Good running sandals are tough to come by, so the Circadian Lifestyle sandals from Earth Runners really surprised us when we found them. These beauties are lightweight, comfortable, grippy, and they have a nice snug fit that keeps them in place all throughout a run. We love the grippy topsole texture and the lightweight Vibram Gumlite outsole the sandals are made with. They are tough enough for hard use too, and feature nylon webbing reinforced with stainless steel thread to withstand plenty of force during use. The only downside with these tough sandals is that they ship slowly, so order them as soon as you can because you’ll be waiting a few weeks to get your hands on them. We looked for footwear made from tough and weather-resistant materials like leather, rubber, polypropylene, and treated canvas material. We looked closely at the thickness of the material utilized and at the finish or treatment given to the sandals to help it hold up through use. After material itself, we looked at how those materials were used to craft sandals that will hold up. We looked at stitching and padding closely to decide which sandals are tough enough to be one of the best. To really test their durability we slipped on each set of sandals and wore them for several days to see how tough they feel in different situations during the day. We mean it when we say our top selections are tough. It should go without saying that quality sandals are comfortable on the feet. 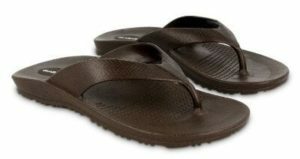 We evaluated this quality during our wear tests and won’t decide how a sandal feels until after an extended wear period. Uncomfortable sandals were removed, while the most comfortable options were highlighted for it. Style is subjective, but we looked for options we think looked stylish and that have a good following of customers happy with their appearance. Many of our top picks are offered in multiple styles and colors, giving you more to choose from. Finally, we decided whether sandals are worth their cost or not. Some options are way more expensive than they should be for what they are made from – we eliminated those products from our consideration. We used all the factors above when deciding what a pair of sandals is worth, and we avoided items that were priced too high for what they offer you.